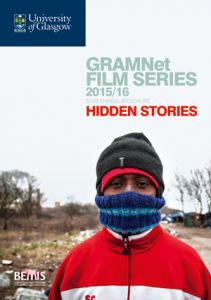 The 2015/2016 Film Series is organised by GRAMNet (Glasgow Refugee, Asylum and Migration Network) and BEMIS Scotland. The aim of Hidden Stories 2015 is to bring the often untold, surprising knowledge of migratory movements into view and to sharpen the focus on the unusual lives and journeys which are part of the epic stories of migration which feature in our programme. The films we have selected, and for which we have received generous support often from the makers and distributors themselves are told in different ways, at times gently, at times with humour, at times with anger, at times with a steady carefulness. They are all human stories and by letting the camera angle and focus be part of the story telling it is possible to reflect too on the role of film in human rights education and education for social justice. Our emphasis is on both the simplicities and human complexities of hidden stories and the revealing of knowledge, the emotional attachments and detachments that often accompany migration. Following each film, invited local organisations and community groups will suggest positive actions that can be undertaken locally to address one or more of the issues raised in each film. Sponsored by GRAMNet, BEMIS Scotland and the Iona Community, with the support of the Equality and Diversity Unit, University of Glasgow.